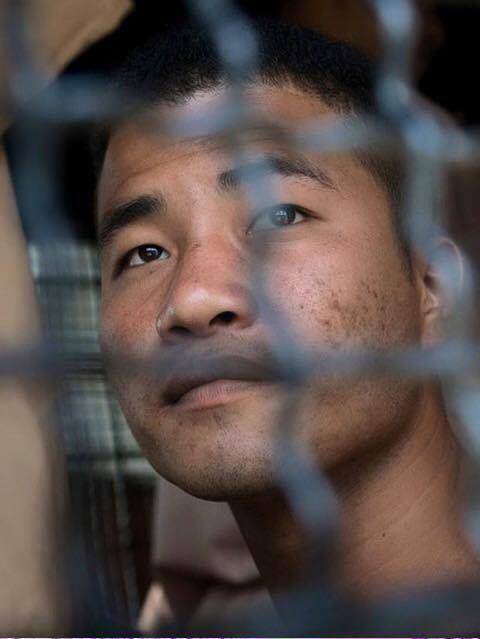 Zaw Lin, one of the two migrant workers convicted of the murders of Hannah Witheridge and David Miller on the island of Koh Tao in 2014, has spoken out from behind the bars of Death Row in Bangkok’s notorious Bangkwang prison, A.K.A the Bangkok Hilton. After initially confessing to the crime both Zaw Lin and Co-convict Wai Phyo strenuously denied having anything to do with the deaths of the young British backpackers and told the court they were tortured into confession. 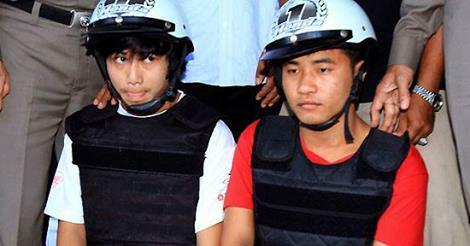 The men only recanted their confession after receiving support from the Myanmar embassy days after their arrests. The men are now spending their fourth year behind bars after being convicted of the murders and sentenced to death. They lost their first appeal that was read at the same court in which were convicted. 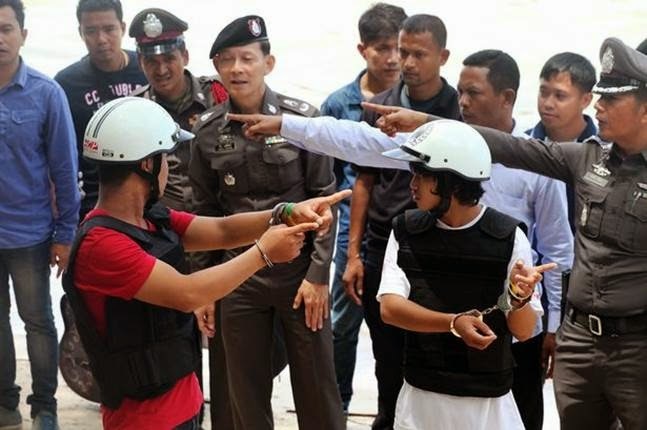 The case has caused much controversy and international outcry, including protests on the Thai Burmese border, due to lack of evidence, motive and a highly dubious police investigation into the deaths of Hannah Witheridge and David Miller. The fact that a local mafia figure and his nephew were implicated until the police chief in charge of the investigation was taken off the case has done nothing to calm the fears of those who believe there is a massive cover up going on! In a world exclusive Zaw Lin has now told his version of events on the night of the murders including accusations of torture by local police and a set up to use him and Wai Phyo as scapegoats for the murders. Mg Mg, Wai Phyo and I, we are not old friends. We are boys in Arakan State of Myanmar but we are not the same village and we did not know each other in Myanmar. I just knew them at Koh Tao of Thailand, because Mg Mg and Wai Phyo came and work my restaurant for one month and left and then Mg Mg got a job at A.C 2 Restaurant and Wai Phyo got a job at Safety Stop restaurant. We all were waiters at restaurants. I, Zaw Lin, worked at Brother Restaurant and normally I got to work at 5.50am, I get to my working place at 6.am. I work from 6am till 12pm and went back home and rest for 4 hours and after resting for 4 hours I went back to my working place again at 4.00pm and work till 10pm. About my friend Wai Phyo. He worked at Safety Stop Restaurant. He work 9 hours per day which is from 16.00pm to 10.00p. He sleep with one of his friends named Mg MG at the night, at the afternoon he stay with one of his friends named Awng Zaw Lin, Awng Zaw Lin room is nearby his restaurant, it is about 10 mins walk from his room to the restaurant where he worked. Wai Phyo stayed with his friend because his boss did not give him a room to stay. My friend, named Mg Mg, he worked at A.C.2 restaurant. He worked from 8am till 16.00 pm he rest from 16.00 pm to 5pm and then he went to work again from 5pm till 11pm. He lived very close to his work place, about 2 minutes’ walk from his place to the restaurant where he worked. The nightmare beginning on the 15th of September 1014. I am not mistaking about the actual date. Me with 2 of my friends, Wai Phyo and Mg Mg went to the beach to have fun. Just to play guitar and have some beer, and I am wearing my working uniform, red colour and black jeans. Wai Phyo was wearing black long staff shirt and black jeans and Mg Mg was wearing blue uniform shirt and short black jeans. First before we went to the beach me and (Wai Phyo) wait for Mg Mg at his working place A.C.2 restaurant close work. He close work at 11.oopm and we went to 7-11 together to buy some beer and we brought 3 big Chang beer and I packet of cigarettes and drove down to the beach on my motorbike. We get to the beach about 11.20 pm or so and stay under a tree, playing, singing and drinking beer. We were just having fun. At that time everywhere was dark that we cannot be able to see someone who is about 30 meters away and all the restaurant at the beach has already closed. By that time only A.C bar is open because it opens all night. Wai Phyo and Mg Mg change clothes because Mg Mg said that he was feeling cold and when we finished drinking the three bottle of beer that we brought from 7-11 Mg Mg left but I do not know where he goes. Then me and Wai Phyo drove to 7-11 with my motorbike to buy some beer and we brought 2 big bottles of Chang and went back to the beach where we were bfore at the beach under the tree. After about 10 mins time Mg Mg came back with one bottle of red wine and gave it to us, me and Wai Phyo and I asked him if he want to drink with us. He said not and asked me to borrow my motorbike because he wants to go and see his girlfriend. I gave him the key of my motorbike and he left about 12.20am. Now is only me and Wai Phyo left under the tree playing music and drinking and I open the red wine for us to drink and we find out that the taste is not good, I threw it into the sea and Wai Phyo and I stayed under the tree till nearly 26.00 am and then it started raining so we decided to go back home and Wai Phyo said that he wants to go swim before going home and we walked to the A.C 2 restaurant because it is very close to Mg Mg room and A.C 2 restaurant is before the A.C bar. At A.C bar there are a lot of people some are dancing, some are swimming and some are playing fire dancing. I think about 300 people and we kept our belonging at the A.C.2 restaurant and went to swim in front of the A.C 2 restaurant. Which we swim about 10 minutes more and came back to where we kept out belongings at A.C.2 restaurant and we could not find our belongings anymore and we search around the restaurant and could not find ‘my’ them. I mean we could not find my guitar, our shoes, and clothes. Then at about 26.20am and Mg Mg is not yet back, and there is no way I can go back home without my motorbike so I decided to sleep with Wai Phyo at Mg Mg room, because from A.C.2 to their bungalow was there stand is about 2 minutes walk, and when we got to the room about 5 minutes time Wai Phyo said that he wanted to go back to A.C.2 restaurant and look for the guitar and our clothes and shoes, and I said to him if you want to go you can go alone because I want to stip now and then he left and I slept off and woke up in the morning around 6am and saw Wai Phyo sleeping on the bed but Mg Mg was not there so I looked around the room. I saw my motorbike key on the table, so I thought Mg Mg might have left for work and I woke Wai Phyo and said to him lets go to my place where I stay, and I sent him to one of his friends named Aung Zaw Lin who is from his village and I drove to my place where I stay and that is all about that night. On the 2nd of October 2014 police burst into my room at 4am and I am sleeping at that time they arrested me and took me by car to a bungalow which I know will that place is not police station and they asked me if I kill 2 people that died on the beach on the 15th of September 2014. I said not but on the 15th of September 2014 I was with 2 of my friends, went to the beach to play guitar and have some beer and at the time we were there I did not see anything happen, I mean nothing happen at the beach when we are there. Sorry there is one man with them, he is a foreigner, first of all he said to me he will be my translator and when he speaks with me I find out that he is not from Myanmar because his Burmese speaking is not really correct. Really is a man looking I think like is from Bangladesh. Maybe he stayed in Myanmar before and when I said that I don’t know anything about the killing they the translator and the police they will start beating and kicking me on my face and chest and they brought a plastic bag and use it to cover my face so I cannot breath. About five of them in the room and each time I said that I don’t know anything about the murder they tortured me more and they said to me if I did not accept or sign the document they will shoot me, and no one will know what happened to me because nobody saw them when they pick me up at my house and no one know who they are. Then when they are saying these words to me one of them put a gun on my head and they said if I do not accept them they will kill me here and if I accept I will only spend 2 to 5 years in prison. They tortured me and threatening me for 2 days in that room, no food, no water to drink for days and nights, and they tortured me till the torture is too much for me that I cant bare it anymore and I don’t know what to do because I don’t want them to kill me there. I decided to sign for them and I sign the document for them, and they are very happy and they stop beating me and they took DNA from my mouth with one of cotton. In the morning they brought Wai Phyo to the same room where I am and we talk to each other and he told me what they did to him, the same thing they did to me they did to him also and then they now told us how we will act when the media come in. I mean they teach and show us what we do on the scam because they said to us that they are taking us to where the incident happened and the media are waiting for us there if we get there we should act as they have instructed us and they also instructed us not to speak in front of the media. If we disobey their order they will kill us after we finish with the media. They took us to the beach where the incident happened about 6,30am – 12.00pm so all those act people saw on news is fake its all their plan. After all thse with meida they took us to police station. We slept at police station one night and then next day they took us to Koh Samui prison. After my embassy came to visit us and we explain all this to embassy and the day embassy came to visit us at Koh Samui prison, Wai Phyo explain to embassy how must Mg Mg on the way between A.C.2 restaurant when we went back to A.C restaurant that early morning about 26.20 am and how found mobile phone at A.C.2 restaurant so after embassy left I ask Wai Phyo why he never told me anything about mobile phone when we were driving to my place where I stay to show it police whose phone this is and give back to its owner and I asked him again if he did steal it from someone and he said not. Really he found it beside the restaurant, and why he never told me that he met with Mg Mg on the way between A.C.2 resort about when he went back there and he said to me that he forget to tell me and now he explain everything to me in prison. And I do not understand why Mg Mg was not blamed by the police, only me and Wai Phyo were blamed by the police and were put in prison but I am happy for him to get set free by the police. That is all I remember. I hope you find out something to help me. Please extend spread this story all over the world by using your Facebook account and that they may find out the fact who read the story. Since the gruesome murders many other young British backpackers have lost their lives on the island in mysterious circumstances. The families of whom are also appalled by the police investigations. So much so one mother, Pat Harrington, whose son Ben died on the island, will be presenting a petition of 15,000 to Downing Street next month demanding the UK Government look in to British deaths in Thailand. Sad, seems we will never really know the truth. I don't know all the facts but I am also aware people are often scapegoated for convenience. Yep, sadly seems these two are scapegoats, to protect the 'Family's Koh Tao that runs things. No one with an IQ of over 20 believes these two are the killers. This just demonstrates the power of the feudal lords who control that area. So cynical. I don't think they did it - but someone needs to be held to blame. I can speak Burmese, and they number many on Turtle island, almost like slaves. Recall the American that built a fantastic resort on this island? He was told if he wanted to be breathing in 24 hours, he'd better make himself scarce. I have to ask, do you speak Turtle? do you speak Slave? I can't speak turtle, largely owing to the fact that they are ectotherms. I can speak to and understand Mitch McConnell however. I do a great slave impersonation, I'm a superb mimic, but it's not politically correct these days, and besides, I'm on the side of the slaves. I must ask, which dialect? Alabama with a taint of Tennessee. Also I like riding - well she called it horseback riding - I'm willing to be fair and I'll split the difference. I suppose she doesn't want to upset ma and pa.